The Toronto Maple Leafs are simultaneously one of the NHL’s most storied franchises, and one of its most tortured. The fans of the Maple Leafs can revel in the 13 Stanley Cup titles the team has won, second only to the Montreal Canadiens. However, they are suffering a 48-year title drought that stretches back to 1967. 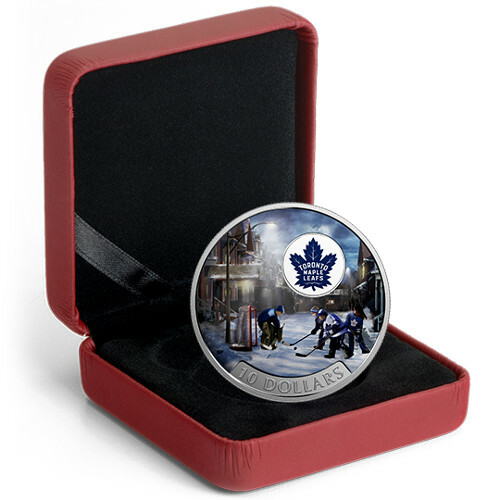 Today, the 2017 ½ oz Proof Silver Canadian Passion to Play Toronto Maple Leafs coin is available online at Silver.com. Ships in a maroon clamshell with a graphic beauty box. Mintage limited to 15,000 coins only! One of seven releases in Passion to Play! Face value of $10 (CAD) is fully backed by Canada’s government. 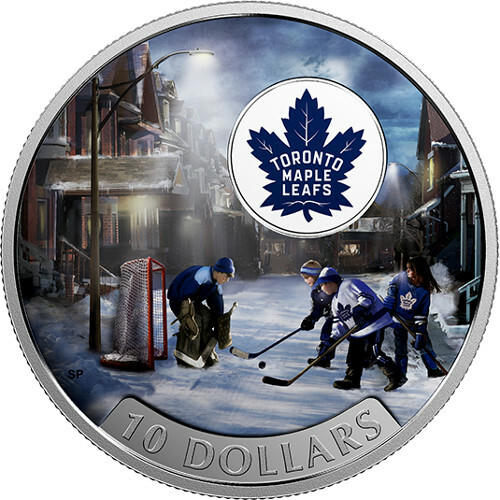 Children playing hockey and the Maple Leafs logo on the reverse. 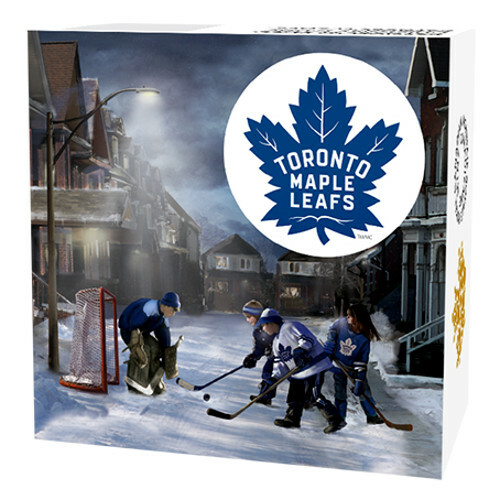 Founded in 1917, the Toronto Maple Leafs are one of the NHL’s Original Six franchises, the six teams which participated in the founding of a league that now includes 30 franchises in total. The franchise has had an interesting past when it comes to names. The team was known simply as Toronto at first. Then the team went by the name Toronto Arenas as it was owned and operated by the Toronto Arena Company, which also owned the Arena Gardens where the team played. A 1919 transfer of ownership by the NHL led to the team being renamed again as the Toronto St. Patricks, and after a sale in 1927 it was again renamed, to be known from then on as the Toronto Maple Leafs. 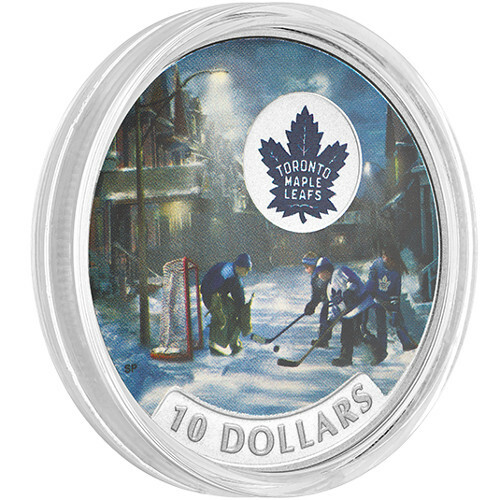 All 2017 ½ oz Proof Silver Canadian Passion to Play Toronto Maple Leaf Coins in this collection arrive in a maroon clamshell from the Royal Canadian Mint, along with a graphic beauty box displaying full-color artwork. The use of NHL, the NHL Shield, and NHL team marks is trademarked by the National Hockey League and property of the league and its franchises. 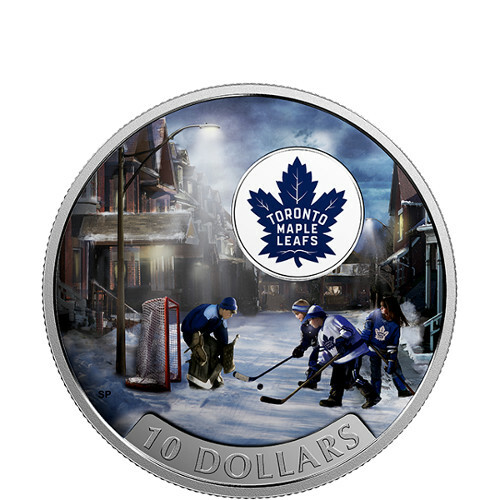 The reverse of all Proof Silver Canadian Passion to Play Toronto Maple Leaf Coins includes the image of a group of children playing hockey on a frozen street in suburban Toronto. The street lights provide all the light these children need as they dream of making it to the big stage. 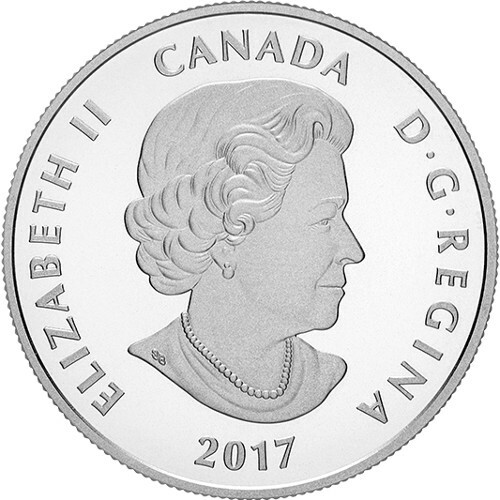 On the obverse is the right-profile portrait of Queen Elizabeth II. Her Majesty’s effigy has featured on Canadian currency since she ascended to the throne of England in 1952. This depiction is a 2003 creation by Canadian artist Susanna Blunt. Please direct your questions to a Silver.com associate by calling us at 888-989-7223. You can also connect with us online through our live web chat and email features.